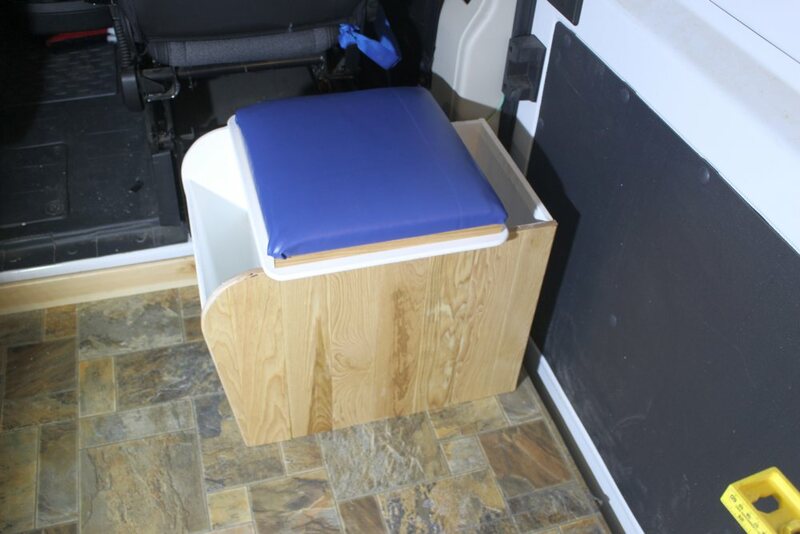 This section covers our homemade composting toilet for our ProMaster camper van conversion. 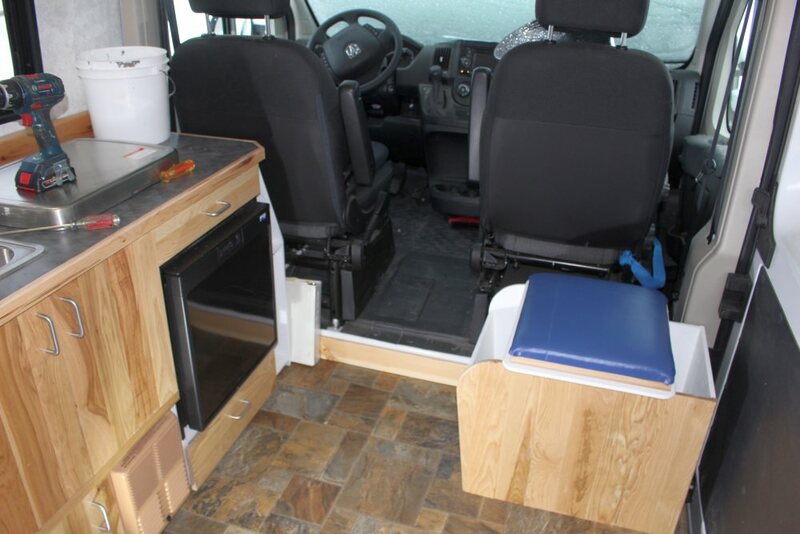 The DIY composting toilet is located up front just behind the passenger seat and next to the sliding door. It also provides some map etc storage and an extra place to sit. The toilet design includes urine separation and includes a small vent fan that runs all the time to keep odors down and maintain an aerobic composting process. The finished toilet installed behind the van passenger seat. The blue cushion comes off to reveal the toilet seat. You start by adding some peat moss to the bucket — this provides Carbon for composting and provides more air in the mix. When you use the toilet, the urine is diverted into the pee bottle, and poo drops down into the bucket. After each poo, you add a bit more peat moss to the bucket. The pee bottle is dumped as necessary throughout the trip. How often will depend on the size of your pee bottle and how often you use it vs other facilities. An adult is said to generate about 1 liter of urine per day. The mix in the poo bucket will compost some over the course of the trip. When you get back home, you can dig a hole in the yard for it to finish composting in, or you can place it in a plastic bag and put it in the garbage. The volume is said to be much less than you would expect as the composting process reduces volume. The references listed below go into a lot more detail on how the composting works and how to keep the composting toilet working well. The toilet seat is sealed down to the lid of the toilet. 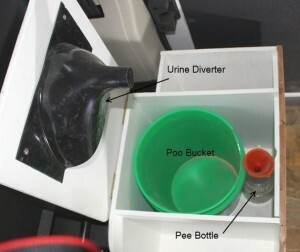 Pee is diverted by the urine diverter into a pee collection bottle just below the diverter. Poo drops straight down into the 5 gallon bucket (which has peat moss/sawdust in it). The pee bottle and funnel removed from toilet for better view. There is room to store two of the pee bottles in the box. 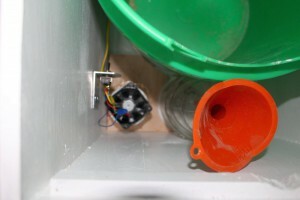 The fan exhausts air from the toilet compartment via a tube that runs down through the floor. There is screened air inlet opening in the opposite corner of the toilet compartment near the top. The compartment on the inboard side provides some storage for maps, books, etc. that is accessible to driver or passenger while driving. 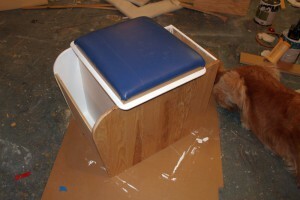 The toilet has a removable seat cushion that seals the top and serves as an extra place to sit. 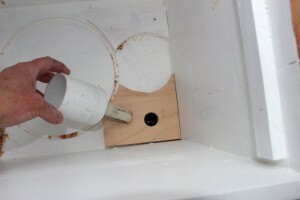 The compartment on outboard side stores toilet paper and peat moss/sawdust. The urine diverter diverts urine into the pee bottle in the base of the toilet — this makes for better composting conditions in the poo bucket, slower filling of poo bucket, and less possibility of odor. The diverter works for both males and females as long as everyone sits down to pee. 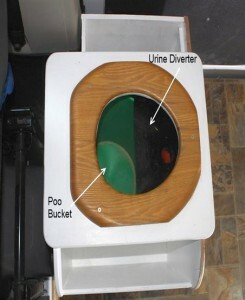 I know near nothing about how composting toilets work, and was skeptical that they would be a good solution for an RV. The references below from people with lots of experience with composting toilets in RVs convinced me that it is a solution worth trying. Efficient on space utilization (can be as small as a 17 inch cube). No need for black water tank and no need for the fun job of emptying the black water tank or finding a place to empty it. 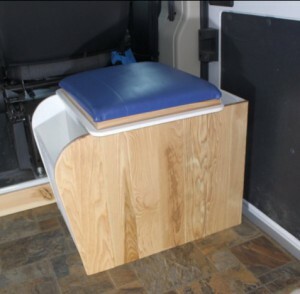 I want to thank Gordon and Sue for submitting all the details on building and using their composting toilet in their RV over the years — this is what got us off the fence on trying the composting toilet. We wanted the toilet to be as compact as possible in that its located in an area with limited space. 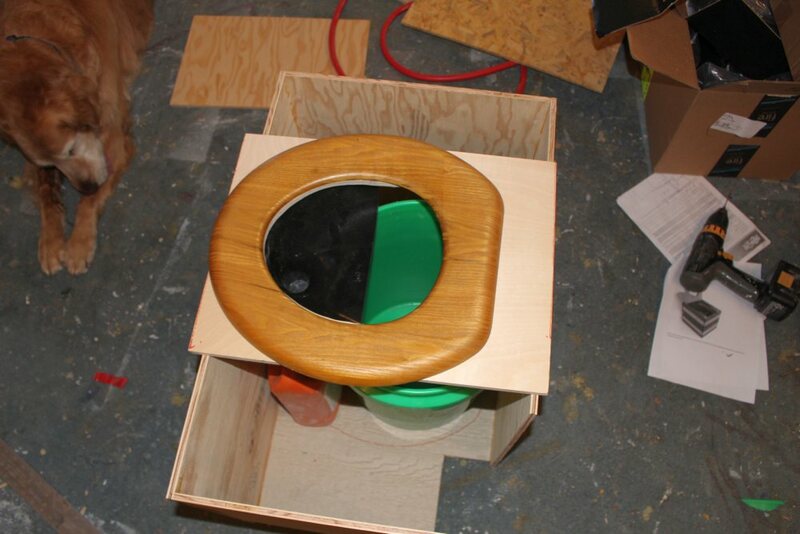 In order to get the size down as small as possible and to make sure that it would fit in the intended area OK, I built a full size mockup — this allowed playing with the relative locations of the bucket, pee bottle, toilet seat, and urine diverter to get a compact arrangement. It also allowed actual testing of the urine diverter. Simple mockup helped to get the geometry right. The toilet seat is a standard one off the Home Depot shelf. They sell ones with round openings and with oval openings — this one is a round opening which uses less space and seems to fit the urine diverter better. The lid that came with the toilet seat was removed, and the bumpers on the bottom of the seat part are removed so that the toilet seat can be sealed right down to the lid of the toilet box. It is important to not leave any openings for insects to get in. I trimmed the left, right, and front edges of the toilet seat to create flats that the seat cushion could fit against — the seat cushion (see below) is just a friction fit against the flats on the toilet seat. The board the toilet seat is mounted on is hinged at the back to allow access to the poo bucket and pee bottle. 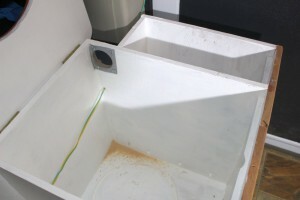 The box closes in the bucket, bottle and vent fan, provides for storage for peat moss and toilet paper, and provides an enclosure for the airflow created by the vent fan. The box is 17 inches front to back, 23 inches wide (including storage areas), and 18 inches tall. We tried to make these as small as possible because the space we have is limited. If you have more space, I’d consider allowing for a bigger bucket and particularly a larger urine container. The base of the box is made from some 3/4 inch Medium Density Overlay (MDO) plywood I had left over. 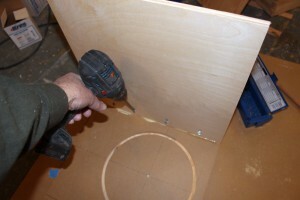 I routed a groove in the base for the bottom of the bucket to fit into. 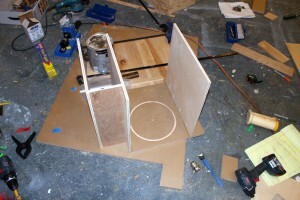 The back and sides of the box are made from some left over half inch birch plywood. The partially assembled box. 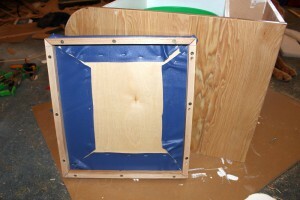 The back, outer sides and front are just nailed and glued to the base board. 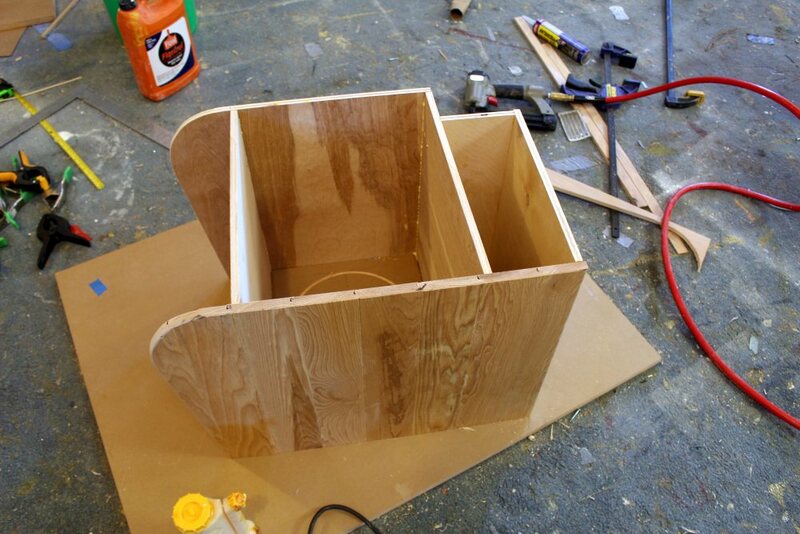 Using Kreg fasteners + glue to attach the box fore and aft internal partitions. The front of the toilet box is made from the same Hickory boards that we used for the galley cabinet — I had some of this left over from the galley cabinet and thought it would be nice to have the two cabinets match. Trimming the front fact to final size. 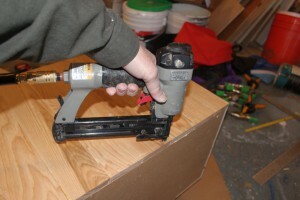 Using 1 1/4 inch finish nails with glue to secure front (same for sides and back). The blue vinyl is also from the fabric store. 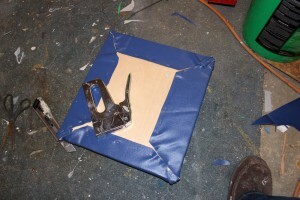 The blue fabric is just pulled over the padding, turned over, and stapled to the back, which is a sheet of half inch plywood. 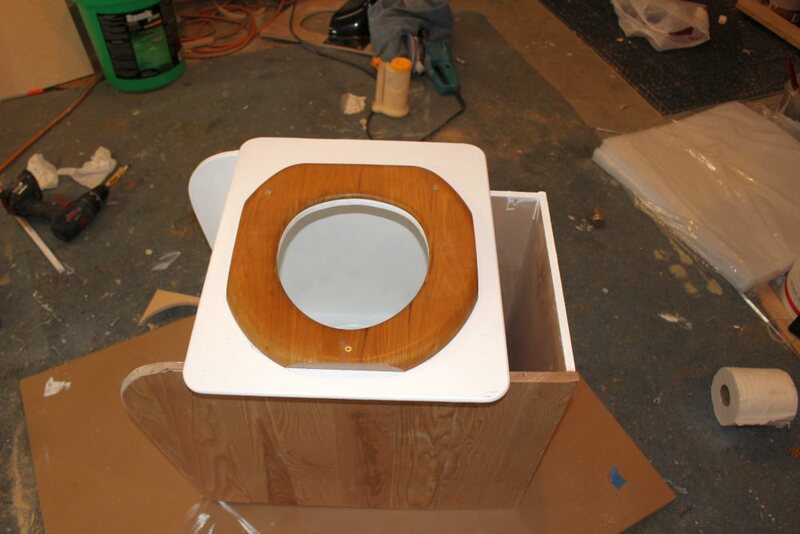 The seat cushion is framed on the bottom with some scrap Hickory — this spaces the seat cushion up the height of the toilet seat, and allows the seat cushion to fit snuggly against the flats on the toilet seat. Some pictures showing how the poo bucket and pee bottle fit in the box. Closeup. 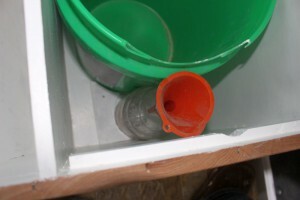 The piece trimmed out of the lip of the green bucket is to allow the urine diverter and lid to close on the bucket. 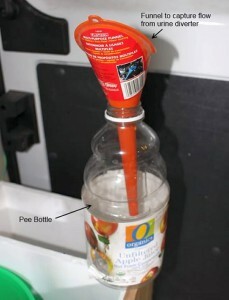 The little funnel channels the urine from the urine diverter into the pee bottle. I was going to use a piece of tubing, but ran across the funnel lying around, and it seems to do the job. The vertical stack up of pee bottle, funnel, and urine diverter is near perfect. Based on the references, I wanted to be sure to include continuous low flow volume ventilation of the toilet box with the vent flow exhausted to the outside. This helps to keep an aerobic composting process going and helps to avoid the more smelly anaerobic process — it also carries away any potential odors. The fan for the venting should be low volume, low power, and low noise as it runs all the time. I had a few 12 volt fans on hand and tried them out to pick the quietest one. The selected fan is about 2 inches on a side, and uses 75 ma, or about 0.9 watt — this is about 1.8 amp-hours a day out of the 200 amp-hour house battery. The jury is still out on whether the fan is quiet enough — if not will have to buy a quieter one. The fan is on its own fuse, and since the wires going to it are small gauge, I’ll use a small fuse. Also included an on/off switch near the fan so that if the toilet was not in use for a long period the fan could be turned off. 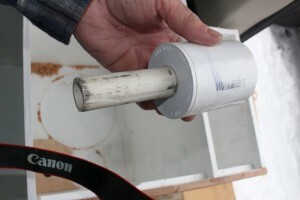 The vent fan is siliconed to the top of a 2 inch PVC coupling, which it fits nicely. 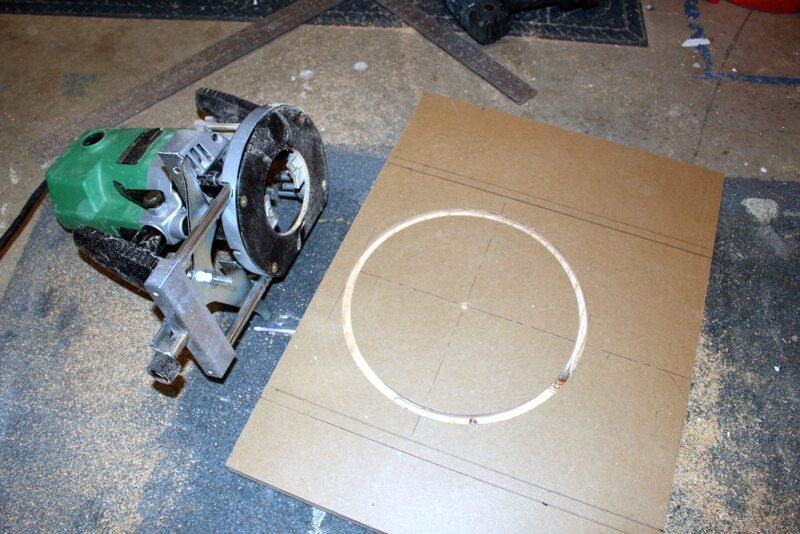 I did not want to drill a 2+ inch hole through the floor, so I used a reducing bushing to cut the size down to 3/4 inch PVC (which fits through a hole slightly over 1 inch in diameter). 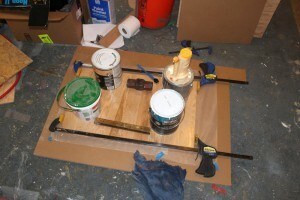 I ran the 3/4 inch PVC through the floor and siliconed it all in place. I’m not sure if reducing the diameter down to 3/4 inch will reduce the flow too much, but it still seems pretty good — will make the hole larger if need be. The hole in the lower right is for the 3/4 inch PVC pipe exhaust vent — it extends down through the van floor. The vent fan is siliconed to the top of the 2 inch PVC coupling. 2 inch PVC coupling with 2 by 3/4 inch reducer and the short piece of 3/4 inch PVC pipe that extends down through the floor. Exhaust fan siliconed to the top of the 2 inch PVC exhaust vent. A toggle switch allows the fan to be turned off, but normally it runs all the time. The screened air intake opening is on the opposite corner of the toilet box from the exhaust fan. We have not used the toilet yet — plan to soon. Whether it will be necessary to mix up the poo bucket to keep enough air in it to maintain aerobic composting. Whether the ventilation air flow will be sufficient and whether the air flow pattern through the toilet compartment is correct. How often it will have to be emptied. Update after first trip: A couple things learned from the first trip: 1) the pee bottle I used is too small — it should probably be more like a gallon, 2) the toilet cushion gets used a lot as an extra seat — its in a handy place for sitting. 2nd Update September 2016: We have now used the toilet on many trips and it has worked well. One thing we did find is that the half gallon pee bottle is too small. After a bit of hunting around, I found a 1 gallon jug that would fit in the same place with only minor rework and that has worked out fine. The new jug is a bit taller and I ended up siliconing a cut off funnel into the urine diverter outlet — the funnel outlet is small enough to fit directly into the pee jug opening. I do want to point out that we don’t tend to use the poo function on the toilet a lot. We are usually in National Forest campgrounds or the like and we use the toilets there for pooing. I think that most people do the same. But, if you want to be away from conventional toilets for extended periods, I don’t see any reason why this design would not work fine — this is based on other writeups I’ve seen on similar composting toilets used in boats and cabins as the only toilet. On the last couple trips, I’ve taken to putting a Costco kitchen size plastic bag into the empty poo bucket, and then add sawdust to the bag. At then end of trip, I just take the bag out and put it in the garbage — since most of the moisture has been dried out of the poo, its light as a feather. I also take along an extra bag just in case the first one fills up during the trip, but we have not come even remotely close to this even on trips that last a couple weeks. Having owned RV’s in the past with a black water tank toilet and also with the porta potty solution, I’d never go back to one of those — the composting toilet with urine diverter is just better all around. Urine diverter $55 1 lb? Plywood and Hickory on hand 31lb? 5 gallon bucket free 2 lb? Toilet Seat (only part used) $15 2 lb? Cushion cover and filling $12 1 lb? The urine diverter was ridiculously expensive for a simple piece of molded plastic, but I could not find anything cheaper. The 37 lbs is the actual weight of the finished toilet. I found this as an alternative to a urine separator. 6 quid in screw fix. 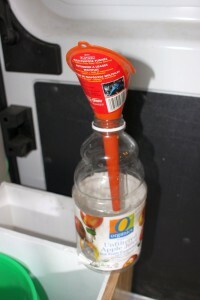 https://www.toolstation.com/plastic-funnel/p34741 Might be useful to someone. Gary, please disregard my last question about the fan. I figured it out. Thanks. P.
Finally getting around to building one similar to yours. I’m pretty clueless about fans. Can you suggest some specs, in terms of volume, and how to best pick one? Are these PC cooling fans? The fan came out of my junk box, and is the smallest one I have — its quite a bit smaller than the typical PC cooling fan. Its about 2 inches square. Please let us know how the project comes out. Did you attach any kind of latching mechanism for your seat/toilet lid to keep it tightly enclosed. Having not tried this before, I would want to have a bucket lid to really seal that bucket when not in use. Am I overthinking this? Thanks for your response and sharing your ideas. 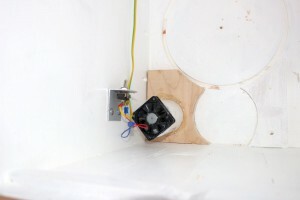 Don’t think a bucket lid is a good idea as it will prevent drying, which is very beneficial. Latch seems like a good idea. I don’t have one but my lid fits snugly. 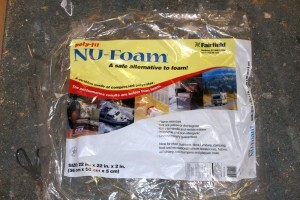 You do need something that seals well enough to keep critters out – even very tiny ones. Many composting toilets utilize a heater to maintain an optimal temperature for aerobic bacterial activity, and to increase the rate of evaporation. It might not be necessary in more temperate climates, but in the north, the good little bacteria hibernate for a good portion of the year. While on the road, a turn or two of 3/8 copper or pex tubing carrying Engine coolant could do the job, and a couple of night light bulbs for when stationary. Be sure that your wiring is suitable and safe for wet, corrosive environment, maintain marine grade practices. Getting zapped through your wee-wee would be a “crappy” way to go! Some sort of thermostatic temperature control would be good to avoid overheating and killing off all the beneficial bacteria. I’m not sure how much it applies to the typical use of “composting” toilets in RV service. We use the composting toilet in the RV in this way — and I think it is fairly typical. – We separate urine from poo so the pee goes in a pee bottle and poo goes into the composting toilet bucket. The pee bottle gets emptied every couple days. 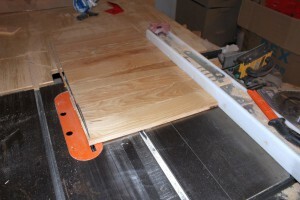 This eliminates much of the moisture and weight. – We don’t use the poo function a whole lot as there are usually toilet facilities of some kind in the National Forest or Provincial campgrounds we stay in. So, poo accumulates slowly. Dry sawdust is added with each poo. – The vent fan dries out and shrinks the poo, so the volume in the poo container grows very slowly. I’m not sure how much composting is really going on. It might be more accurate to call it a urine separating desiccating toilet. The end result of this is that we can go about three weeks or more before we need to empty the poo compartment, and since we use a plastic bag to line it, this consists of pulling the liner out of the bucket, pulling the liner tabs tight and throwing it in a dumpster. Since the poo has been dried out, three weeks worth of poo weighs very little and the liner is easily pulled out and deposited in the dumpster. So, we have not attempted to make compost with it, which is a little less than fully satisfying, but contrast this to the popular cassette toilet where pee, poo and flush water all end up in the toilet tank along with some often nasty chemicals. In a short time you have a tank full of this not so nice mix that is difficult to dispose of in a convenient and responsible way. I think that if you were living in an RV for an extended period, it would be possible to actually generate usable compost, and I do know of people who do this, but it usually takes some additional time to finish the compost outside the toilet. Hi Gary, I’ve been following your build with interest a I am considering a similar rv build. 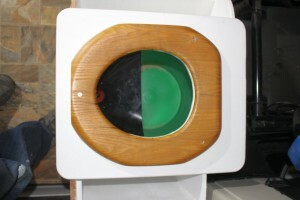 I have used a home build composting toilet in my home for over a decade, and also use a composting bucket toilet in my camper van over the last 3 years. I stay out camping for as much as 4 months at a time, so I’ve got lots of experience by now. I recommend coconut fiber- also called coir, over peat moss. It is instantly absorbent, where peat moss is somewhat hydrophobic and absorbs moisture slowly. Coating the outside of the poo creates a biofilter so faster absorption is beneficial and I have no odors with my toilet. It travels in the van with me at close quarters with no offense. You can get coconut fiber at any large garden store or big box store. Like peat moss it is shredded. It’s more convenient to carry and use than peat moss because it comes in a compressed block about the size of a brick. I buy a package of 4 bricks and break them open as needed. I get more than 30 uses per brick. It’s also less powdery and dusty than peat moss. When my toilet bucket is full, I look for a vault toilet to empty it in to. I am confident that my toilet contents will not cause any problems when the vault toilet is pumped. Urine diversion is critical. With urine in the toilet I think I would get a few days Before I needed to empty. I use a separate urine container with a funnel. I like the Freshette brand (sold at REI) because it has a tube attacked which fits nicely into my urine jug. Thanks for the notes on your composting toilets. Will definitely try the coconut fiber on our next trip. Sounds like you have quite a bit of experience with the composting toilet. If you want to put together a description with some advice and some pictures, I’d be glad to add it here. Great job on explaining and illustrating this project! Inspired me to design my own and take the leap. Thanks to your work in posting this I understand the basic concept and can design around that. I think I will have a nicer looking one than a Nature’s Head for about 1/10th the cost! Appreciate it. Glad the description was helpful, and would love to get some pictures and description of what you come up with in your design. Please let us know how it goes. Where did you get your urine divider? There might be a cheaper place to get it as it seems ridiculously expensive for a piece of molded plastic — or you might be able to figure out how to make one. Thanks for the work of your write up. You have inspired me to follow your lead. Please keep us posted on what you build. Have you had a chance to evaluate your design more thoroughly? I’d be curious to know the results…It seems to me that the “mixing” feature on both Nature’s Head and C-Head are rather integral to overall operation. Have not had a chance to use the composting toilet on the RV for an extended period and with routine use every day. I’m not sure that for our normal use of the RV we are ever going to be using the composting toilet every day for poo. It seems like there are just too many regular toilet opportunities around on most days to need the composting toilet for poo — it does get occasional poo use and frequent pee use. And, its not that we are always comping in commercial RV places — we go mostly for remote campgrounds and undeveloped Forest Service sites when we can find them. Used in this mode, the mixing is not really much of an issue. I suppose if we had a really long trip there might be a need to give it a through mixing at some point, but it would have to be a long trip. So, the most important thing might be how you are actually really going to use the toilet. If you plan to use the poo function regularly day in and day out for an extended period, then I think something like the NaturesHead (which looks like a really good product to me) is probably the way to go. If you are going to use the toilet more like we do, then I think the kind of toilet we did (with urine separation) makes good sense and saves some money. I remember going through all the composting toilet designs and agonizing how each one really handled the composting of our full poo load only to find out that this just does not match the way we (and I think most people) use the toilet. You might also want to read through the material that Gordon provided on his use of the composting toilet — this is decades worth of actual practical use. I’d like to hear what you end up doing and how it works out for you. Where did you purchase the urine diverter? What was the product called? Search ebay for “urine diverter” — it will bring up a few. All seem kind of expensive for what you get.